Many homeowners have switched from a traditional hearth to a contemporary fireplace in Salt Lake City. With a modern fireplace, you won’t have to check the hearth frequently to make sure that you have enough logs. You also won’t have to worry about cleaning up the next day. Uintah Gas Fireplaces offers different kinds of contemporary fireplaces in Salt Lake City. With our products, you can keep your home warm without burning a hole in your pocket. You can choose from our collection of gas inserts, log sets, and built-ins. Gas inserts are perfect for homeowners who have existing wood fireboxes, but want to switch to a gas fireplace. With our experienced and skilled staff, we can turn your old hearth into a modern fireplace. 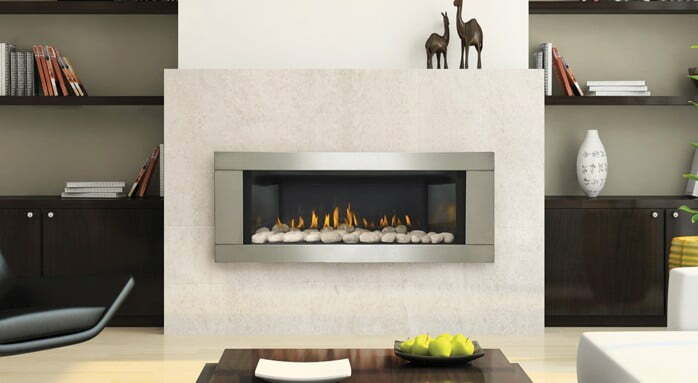 Installing a contemporary fireplace Salt Lake City gas insert is a convenient way of improving the look of your home and increasing its energy efficiency. When you don’t have time to renovate your fireplace, we’ll come to your rescue and install a gas insert. There are two types of gas logs, vent-free and vented logs. When you want a big, realistic looking flame, think about getting vented logs. Similar to real wood, these gas logs are decorative. Vent-free logs are great sources of heat, as the heat generated stays inside the home. Prefabricated fireplaces, such as our built-in and freestanding products, are great alternatives to adding a fireplace in your home. They are more energy efficient and trendy than traditional hearths. Let us help you keep your home warm and cozy this winter. Give us a call or send a message to learn more about our products. At Uintah Fireplaces, Salt Lake City’s number one fireplace store, we pride ourselves on providing the best in customer service. Our staff is friendly, trained and professional. When you come to showroom, you’ll be treated with respect and professionalism. © Copyright 2018 by Uintah Gas Fireplaces. All Rights Reserved.